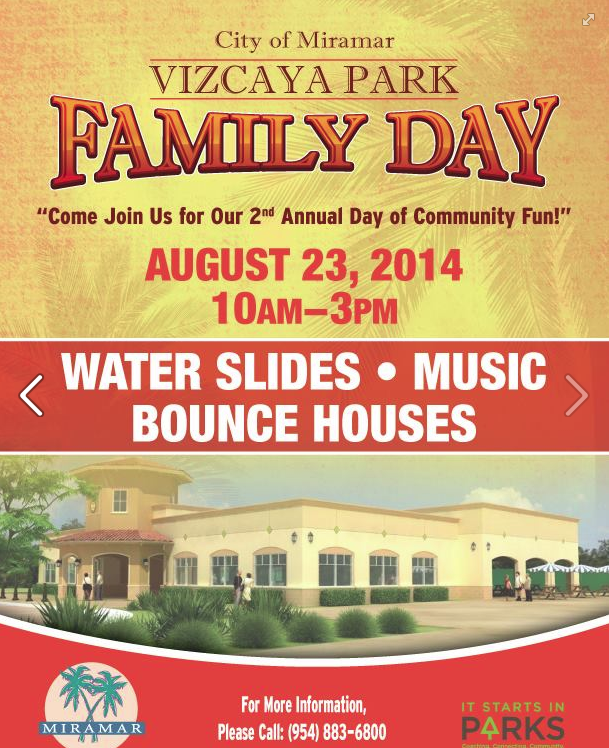 One of my neighbors mentioned that there was going to be a Family Day at Vizcaya Park in Miramar this weekend. So I investigated. The City's website has the next event on its calendar in October. But I did find the flyer mentioning the celebration after scrolling down through their Facebook page. Anyway, it sounds like fun event! Water Slides on a ridiculously hot day? YES! Music and Bounce Houses ought to keep the family busy too. It would have been nice if the City put the address of Vizcaya Park on its flyer, but don't worry, I'm here for you. But if it rains, you make your own phone call to check what's up. From Flamingo Rd, head west on Honeyhill Rd. The park is at the dead end. Drive slowly too! This is a residential area.